Excited to share my Valentine’s Mantel with you today! I really liked how it turned out. 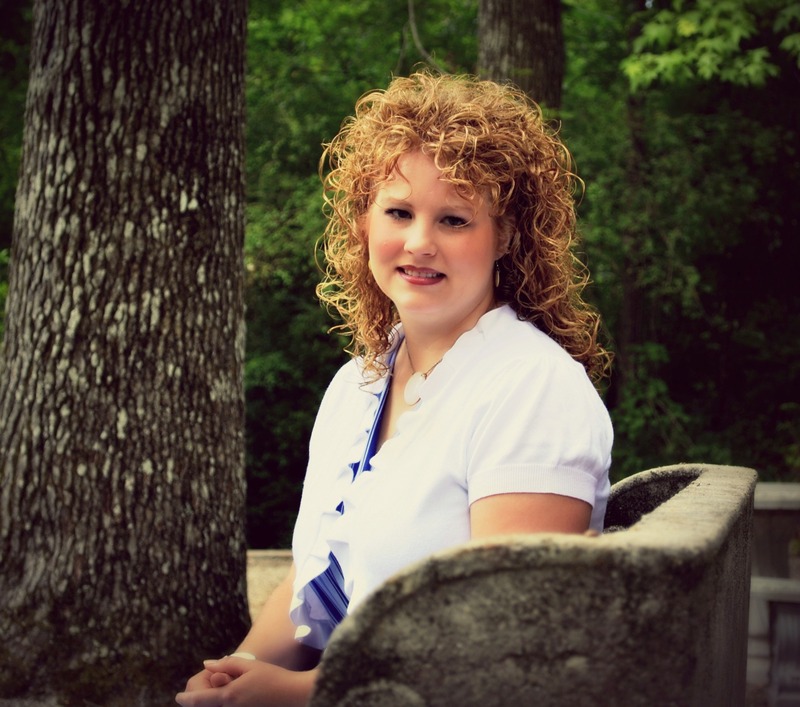 It all started when I saw a blogger (can’t remember which one?) post about a pom-pom garland at Michael’s. So I picked some up a few weeks ago – $2.99 each but I had a 20% off your entire purchase coupon. I love the fun, crafty vibe that it gives the whole thing. I threw in all the pops of turquoise at the last minute. I wanted to incorporate turquoise after I saw Laine’s gorgeous turquoise Ball jars that she tied red and white doilies on. I didn’t have any doilies so I just added the turquoise with the red, white and black theme that I had going on. I kept my same printable that I used last year – you can print your own over at Peppermint Plum. I just backed it with some red paper and put it in a large frame. 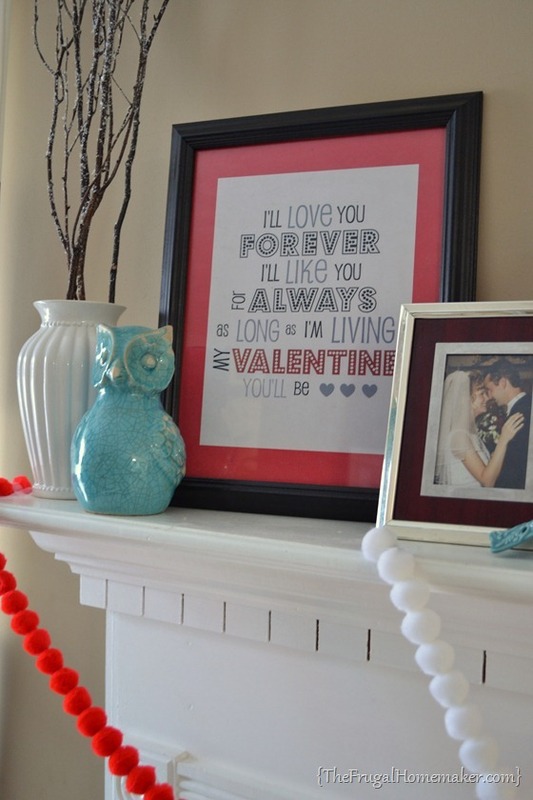 I love free printables – easy way to add some seasonal or motivational décor for pretty much free. 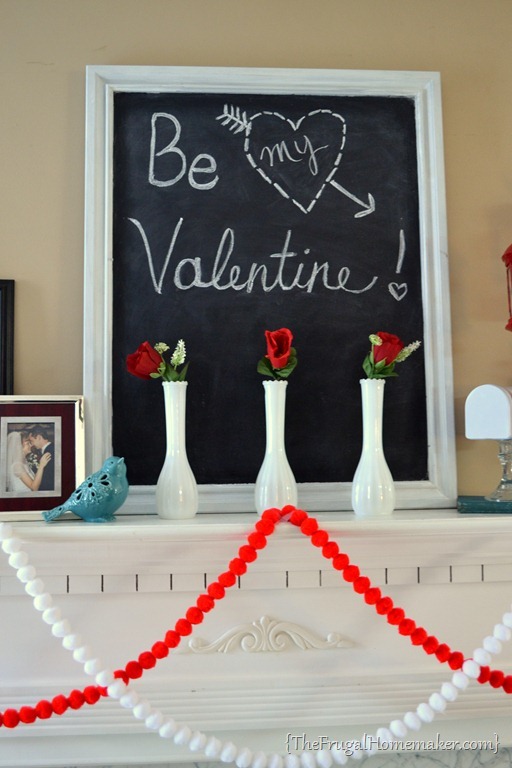 You saw the chalkboard on my Christmas mantel (totally forgot I need to show you how I made this. So look for that post soon.) I am not a great chalk artist but I do find it fun to do. And it photographs really well! Oh, and I picked up these vases at different times at yard sales and Value Village. When I realized I had 3 that matched, I was wanting to use them featured on a mantel like this. I incorporated my red IKEA lanterns that I used last year again. Love them! 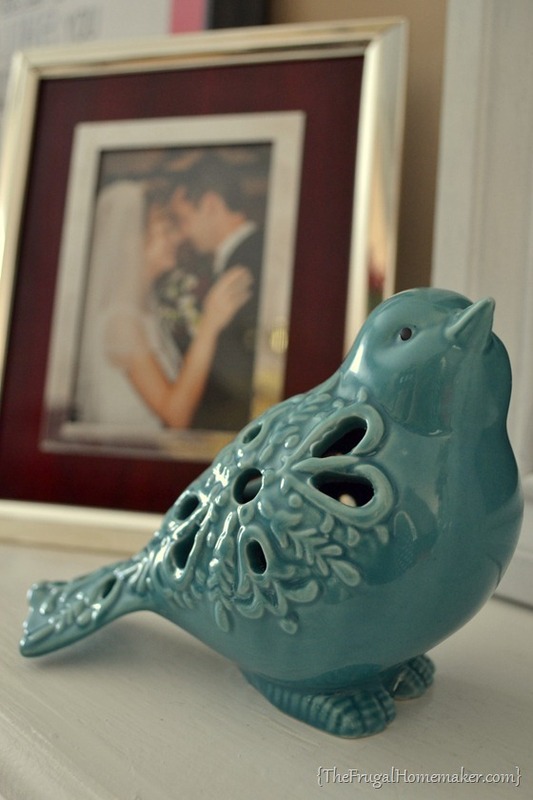 Along with a vintage ball jar, a framed wedding picture, and a fun little mailbox. 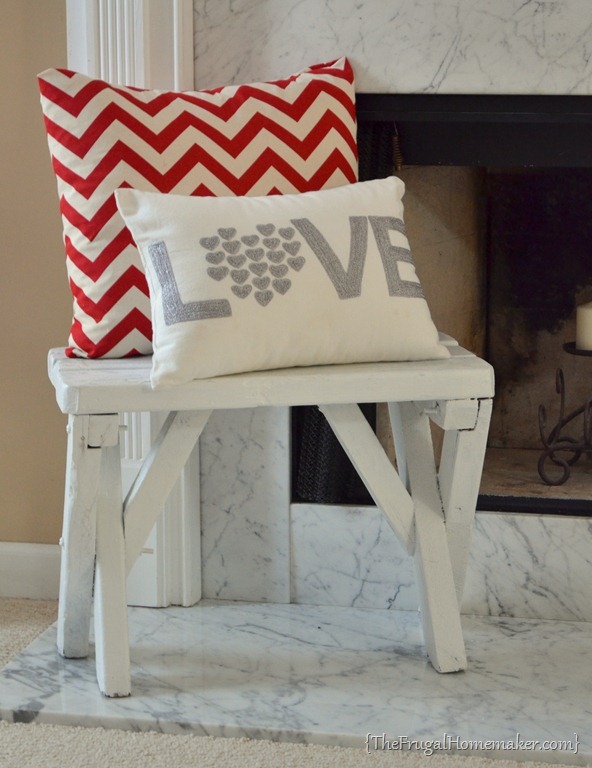 I picked up 1/2 yard of this gorgeous red chevron material at Hobby Lobby and made a quick envelope pillow cover. Would love to either make another one or embellish this one with a red felt heart or something like that (or even a heart in white, black or turquoise?) Wouldn’t that be cute? And you may recognize my $1 yard sale pillow I got a while back – it cleaned up great and I love it! I went with the “less is more” approach on the hearth this time. Was ready for a change. 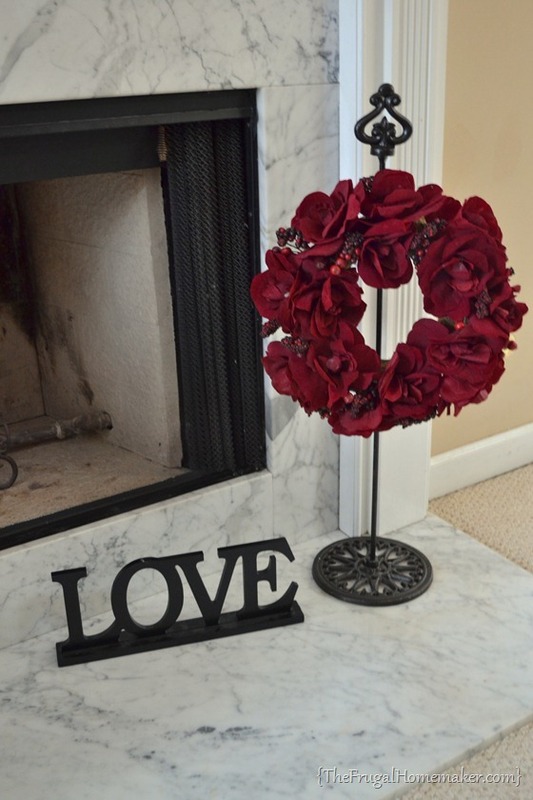 So I just hung a red rose wreath on a wreath stand I have had for several years and added a LOVE wood sign I got at Target dollar spot last year. 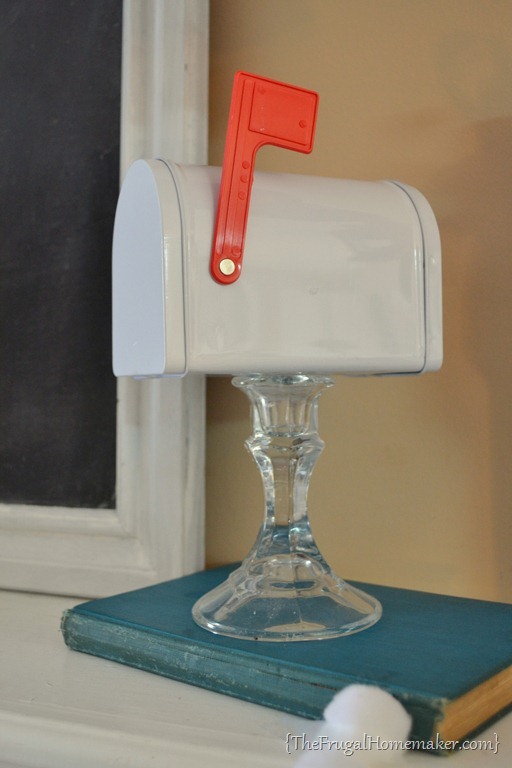 The little mailbox came from Target dollar spot this year and I just stuck it on top of a candlestick! Isn’t it cute? Would be perfect with some love notes or Valentine’s sticking out of it. 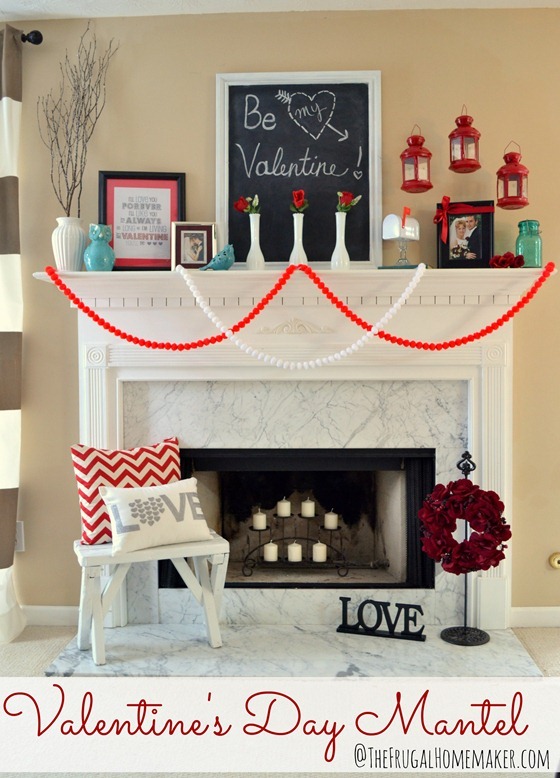 This mantel is fun and red and sweet and I am enjoying it! When you have an amazing husband and an even better marriage, I love celebrating and playing up Valentine’s Day to the max! I adore this little white bench – you are probably getting tired of seeing it on my hearth. It was the best $2 purchase at an estate sale ever. 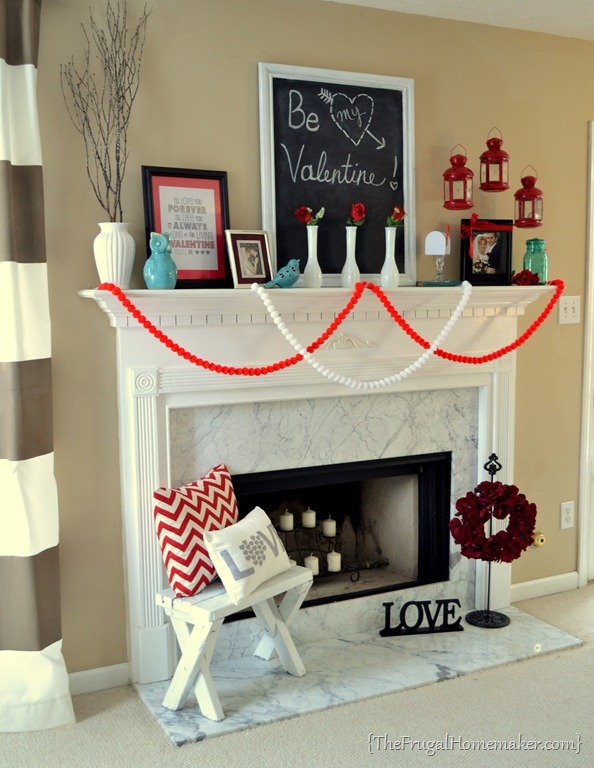 So there’s my Valentine mantel. 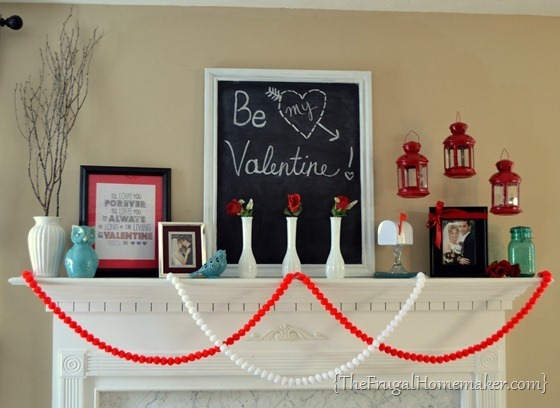 Won’t be too long and I will be decorating for Spring – I SOOO can’t wait! 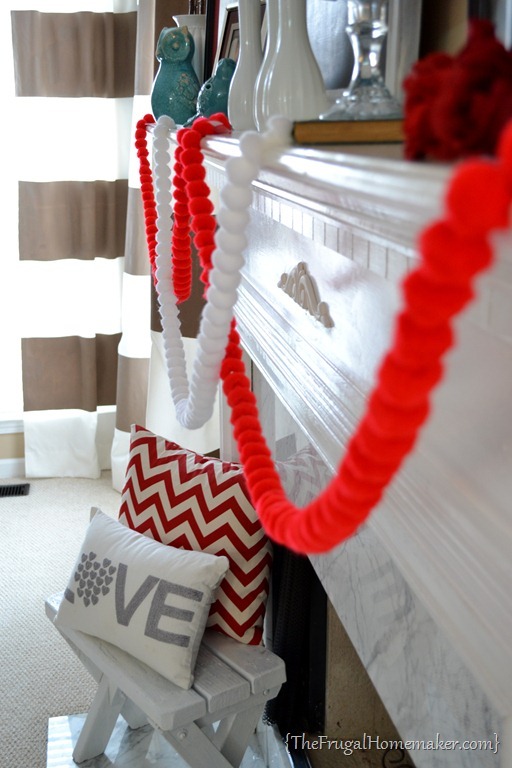 Those pom pom strings are cute! I’ll have to go and pick me up some too! 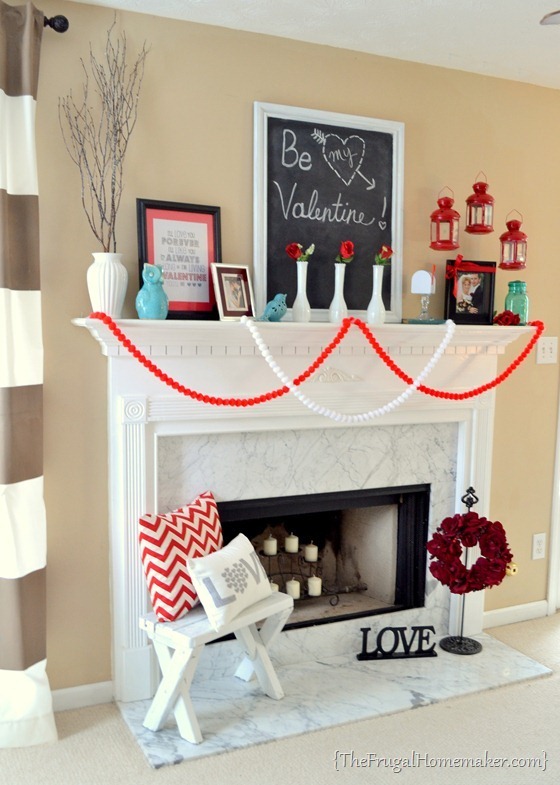 Gosh, we have similar taste 🙂 I bought that same chevron fabric in the blue and recovered my 2 barstool seats in the kitchen just last week….have the same bluc ceramic bird from Michaels on my buffet in the kitchen….and did my dining room Vday decor in red/white/turquoise. 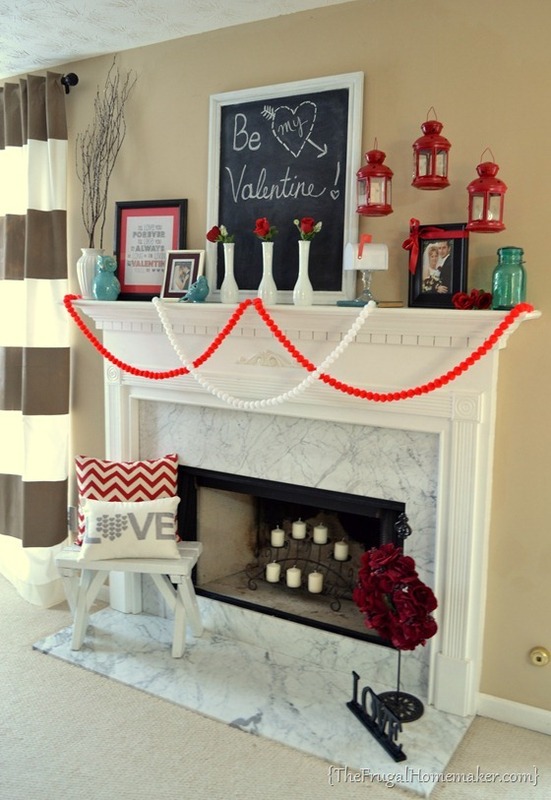 I always enjoy seeing what you put together for your mantel decor. It’s so easy to focus on one area of the house for seasonal decor…I typically do my dining room which is attached to my kitchen. It’s where I spend the most time and where I enjoy the decor the most! Of course the red is gorgeous, my fav color…but the pops of turquoise are genious!! Ooohhh…I just love your thrifted LOVE pillow!!! So pretty – what a great find! 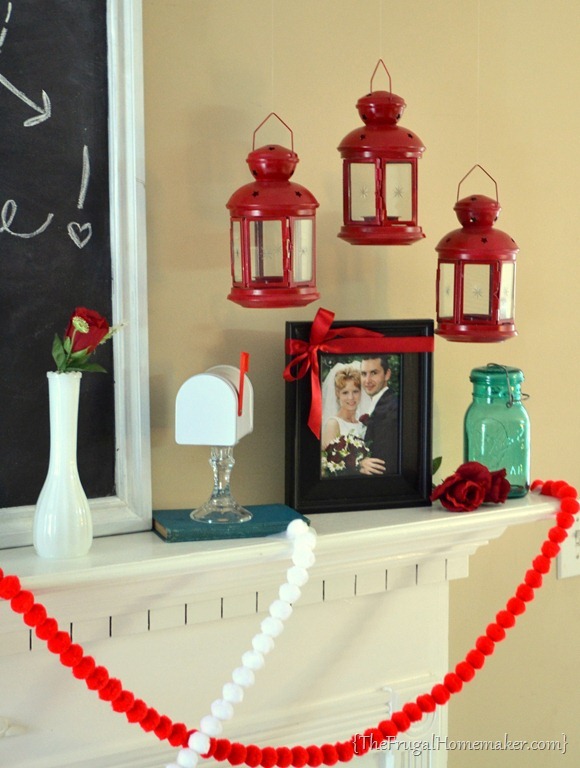 And the red lanterns & pic of you & your hubby is perfect! How are those lanterns on your mantel? They look like they are floating . . . am I missing something?!?!?! I love the blue bird . . . hmm, may have to look for something like that on my furlough. You had me at turquoise & red (colours always through our home as well)…. lovely mantel full of love. I love your Mantel! The colors and everything! 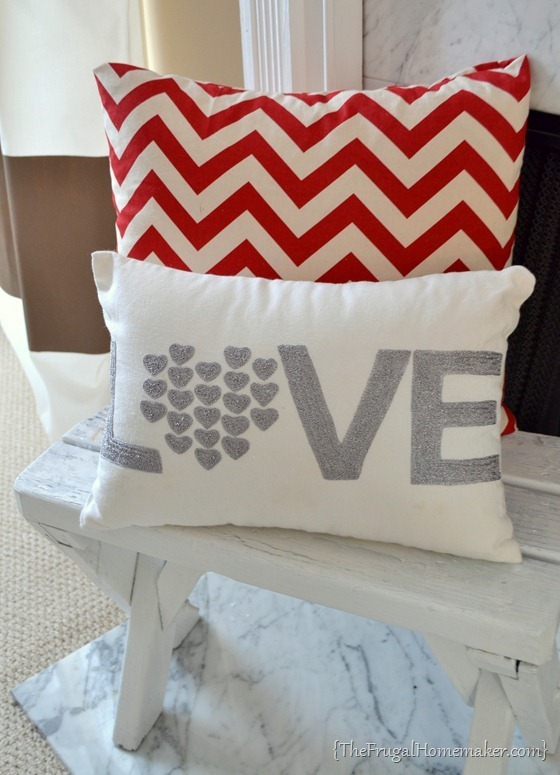 Your thrift ‘love’ pillow goes great with the chevron pillow! Great job! You are very inspiring! I’m with the girl wanting to know how the lanterns are floating. Love those. The lanterns are hanging from the ceiling with fishing line. If you look close, you can see it.